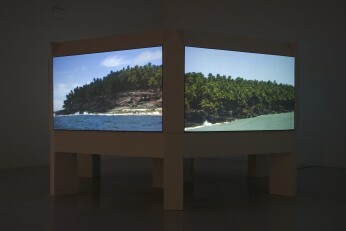 For Devil’s Island, the artist visited the rocky islet off the coast of Kourou in French Guiana, famed for the penal colony to which many French political prisoners – including Alfred Dreyfus – were condemned. The images he brought back are projected onto a hexagonal sculpture referencing another form of disciplinary power: the Panopticon. Part of a circular prison building, the Panopticon allows full-time surveillance of prisoners without their knowing if they are being watched or not, the result being a sense of invisible omniscience.